You produce medium volume concrete batches, but you still want a high-performing plant. Look no further than EconoBatch. With capacities up to 48 yards/hour, it’s ideal for a wide range of applications. It can handle up to six aggregates and two cements, and produce consistently high quality wet or dry mixes. Its flexible design means it can be built to your specifications and expanded as you grow. Its economical cost enables you to become profitable quickly. No other plant in its class meets your needs so fully. Design EconoBatch to meet your specific requirements-it easily adapts to a new or existing facility. Choose from four different mixers to match your production rates. Vary your mixer stand height as needed. 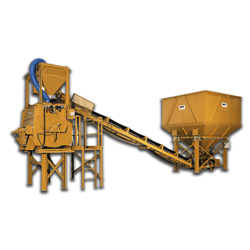 Run the aggregate conveyor from 1° to 45°, in line or at a right angle to save space. Place bins underground, at grade or above grade. 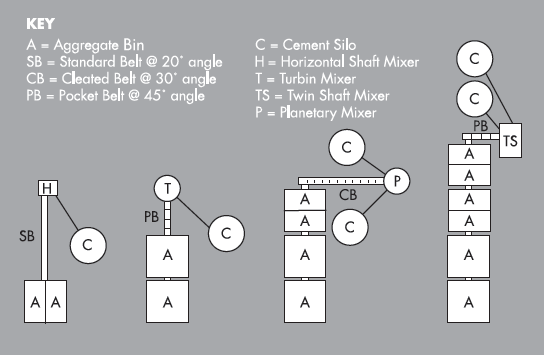 EconoBatch is modular and expandable; start out small and add bins, conveyors, silos and screws as you grow. Unique “ribbon blending” method of charging materials into the mixer in the proper sequence provides cycle times as fast as 2-1/2 minutes. It also ensures a homogeneous mix, with each particle coated with cement paste for maximum strength. All materials are weighed with state-of-the-art load cells for accuracy and ease of calibration. Load cells are matched and scaled to resist water and dust. Weighing accuracy of the aggregates is within +/- 2% and cement/water to within +/-1% of the batch size. 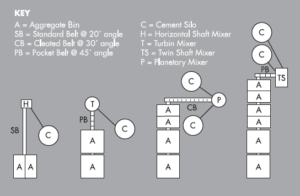 Our computerized control ensures that all materials are sequenced into the mixer at the appropriate time and in the correct amounts for your mix design every batch. Aggregate conveyors are available with inclines as steep as 45° to reduce plant length. 2% of the batch size.